We will be ALL Lithium, it is only a matter of time. We now have the 300 AH Lithium Pack in stock. In my original set four years ago, I found the 200 AH are a bit more limiting and you really want the 300 AH to trend on luxury. With everything running including outside light, fridge/freezer, and TV, it seems you go through about 100 AH in just over a day. In practical terms, I find my 200 AH system will not quite get me through the normal three day cloudy cycle of rainy weather. I mean in my experience it seems like a front is clouding up with rain the first day, rain for a day, clearing up with rain the third, means you really want to be able to go three days minimum without much solar input� The 200 AH is marginal, the 300 AH is adequate to modest reserves without relying on a generator.. Further, people taking the Auto Deploy Satellite Dish, and larger refrigeration systems like the 220 litre, really need the 300 AH sized Lithim system. You can do it with the 200 AH, but the 300 AH is better.. For those with extreme power needs, we also have 400 AH available. The Lithium option is now in over 90% of all Bushtrackers, and we have a couple of new innovations. To protect the investment, we have an elaborate charging system, and low voltage disconnect system, and a manual reset marine switching system to even protect the Lithium batteries from being abused by the big Inverter. There is another relay trigger Low Voltage Disconnect, and these multiple protection systems are there to avoid accidental discharge due to equipment malfunction, that could damage the expensive Lithium power packs. This early a bit crude Lithium was first in my goose neck horse float, and now has been moved to my tow vehicle as a Lithium backup to the truck batteries. It is there to run a National Luna stainless fridge/freezer in the Dodge Cummins Diesel... This is the third vehicle it has been in, now in my "lil ute" for about a year. The stainless fridge freezer running off the truck batteries can run them down when you are not paying attention or parked up and can be a problem.. Now four years on this Lithium set up is still running perfectly..
A solar panel is on the roof of the canopy, and I have a DC to DC charger, and the standard LVD (Low Voltage Disconnect) this is a mini system, works a treat and the Lithiums are showing no signs of aging now at over four years. 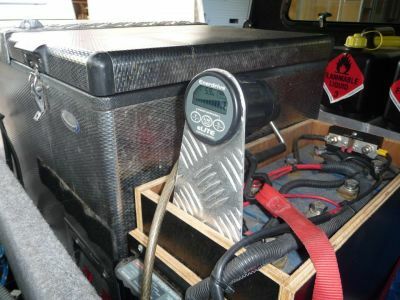 This addition to the truck is no small endeavour, 240v charge, DC to DC charge with 20 amp charger, LVD, BMS, and we have it run by an EPro or Elite battery gauge to synchronize and show percentage of charge. Why? Well, you cannot tell the state of charge with the voltage level in Lithiums. The fridge freezer just runs until is shuts down on LVD. At least this EPro will tell state of charge so you will know how much longer the fridge can run. 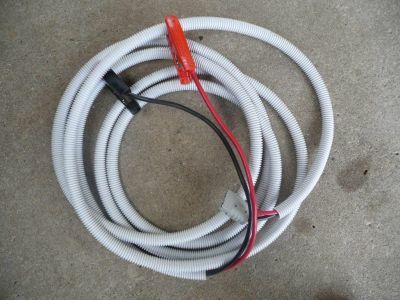 Here it is, now four years on testing, the record so far..
Then, this is a very nice addition an 8 mm extension cord to hook to the Lithium Set and run to an Anderson Plug. The Elite will have a trip to the LVD if the voltage goes to low. This extension was an interesting invention born out of need, to run things like a big ARB Twin Air Compressor. Anyway, Lithium in the truck too? 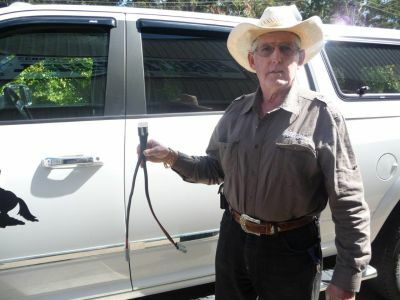 Yes, it is a bit extreme: However, this Lithium could run camp lights, fridge/freezer, air compressor, any number of auxilliary power needs and independent of the truck electrical system. since about 90% of Bushtrackers are now going out with the Lithium set up, I may as well continue this longevity test on the first 200 AH set. Now I have made up an Anderson plug one into two leads. Why? I forgot to plug back in the fridge/freezer didn�t I. Now I can run something else while the fridge freezer stays plugged in..